A kimono fashion stylist, Hiromi Asai (Hiro), collaborates with Susan Cianciolo, a creative fashion designer, for the show at New York Fashion Week 2011 Fall. The show is held at the National Arts Club in New York from 9PM on February 16th, 2011. Feb. 13, 2011 - PRLog -- Many fashion designers become interested in fusion of Western and Eastern fashions. This time, the New York based fashion designer meets and collaborates with the Japanese kimono stylist and presents an innovative fashion show. Susan Cianciolo is a New York-based fashion designer, who is famous for creating various eco-friendly fashion. Her collections are mainly made from recycled, organic and vintage materials. She has been collaborating with Hinaya, a fabric maker based in Kyoto, Japan, these few years. She stayed in Kyoto for a month last November and worked for her new collection inspired by traditional circumstances in Kyoto. Hiromi Asai (Hiro) is a New York-based kimono fashion stylist, who has been creating various fashion styles featuring Japanese kimono for advertisements, films, fashion magazines, and arts. Susan Cianciolo and Hiromi Asai met each other and discussed about the collaboration for the following fashion show. Thereby, Hiromi Asai collaborates with Susan Cianciolo for her fashion show "WHEN BUILDINGS MEET THE SKY" as a kimono fashion stylist at New York Fashion Week 2011 Fall. Various fabrics made at Hinaya Studio are used for this presentation. This is the first challenge that a kimono stylist collaborates with a fashion designer at the New York Fashion Week. 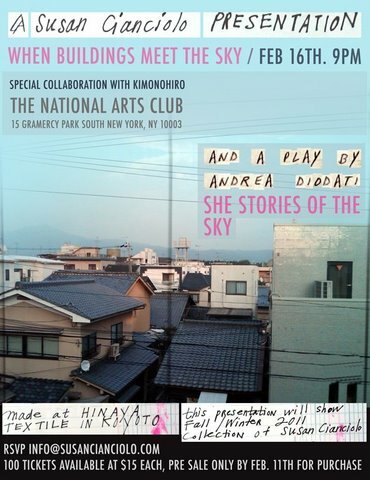 This show "WHEN BUILDINGS MEET THE SKY" is held at the National Arts Club in New York from 9PM on February 16th, 2011. We are looking forward to presenting and creating new fashion though this collaboration. Various fashions inspired kimonos and obi sashes as well as Japanese fabrics will spread more and more in the world. We believe this show is the mile stone on the international fashion scene. We create various fashion and arts using Japanese fabrics and kimonos. We rent various kinds of kimono from huge collections. A wardrobe stylist Hiromi Asai (CEO), provides fashion styling service featuring kimono on various occasions: ads, films, magazines, arts, and fashions. We believe that kimono will be recognized as a universal formal wear that is beyond cultural and ethnic boundaries. We will contribute ourselves to the development of such movement from New York City.